Another week away from home, equalled another week without a sewing machine nearby. The perk of being away though? I topped off a long week on the road for work, by spending an entire weekend with Amanda in Toronto! Highlights of the past few days included great people, amazing food and one fabulous sewing store. While Amanda slaved away on her current WiPs, I found a couple hours to browse the fantastic modern fabric selection at The Workroom. As always, a large portion of my purchase was simply stash building, with no specific project in mind. New additions to my stash include: Raven Lace in Absinthe from Night Shade (Tula Pink), Ladder Dot from Chicopee (Denyse Schmidt), Memoir from Alchemy (Amy Butler), Purple from Hello Pilgrim (Lizzy House), Lei from Seven Wonders (Parson Gray), and Purple Tufts Outfoxed (Lizzy House). I also stocked up on fabrics for two upcoming projects. One project will consists of prints from (left to right): Tapestry Sheeting from The Ghastlies (Alexander Henry), Raven Lace in Vapor from Night Shade (Tula Pink), Tangled Threads from Mama Said Sew (Sweetwater), and Spider Blossom from Night Shade (Tula Pink). And the second project will include Sundials from Fieldstudy, Kaffe Fassett Shot Cotton in Aloe, and an amazing canvas print (of which I can't seem to track down a link for sorry!). Add in a few notions, some Pellon, and some canvas and you have an extremely jam packed suitcase on the return flight home. Oh well, it was well worth all the cramming - I can't wait to whip up a couple new projects with these fabrics soon! 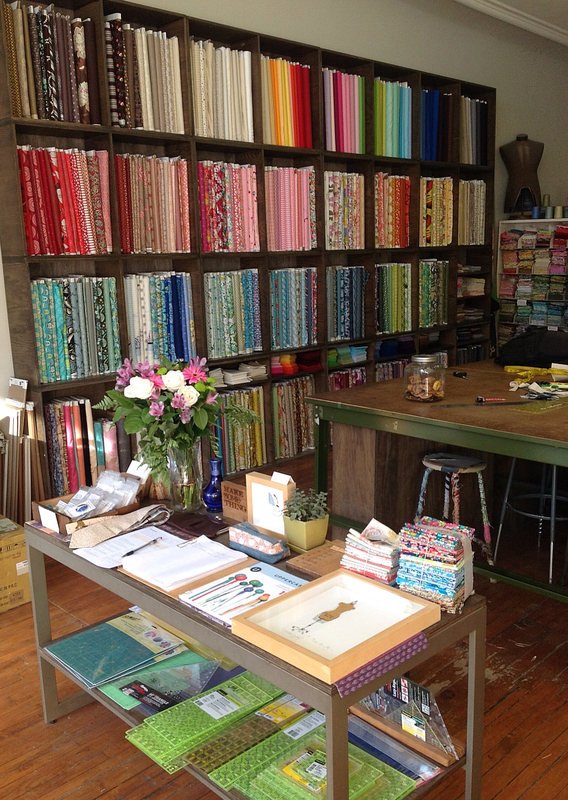 I DEFINITELY am hitting The Workroom on my next visit to TO, it looks fabulous!